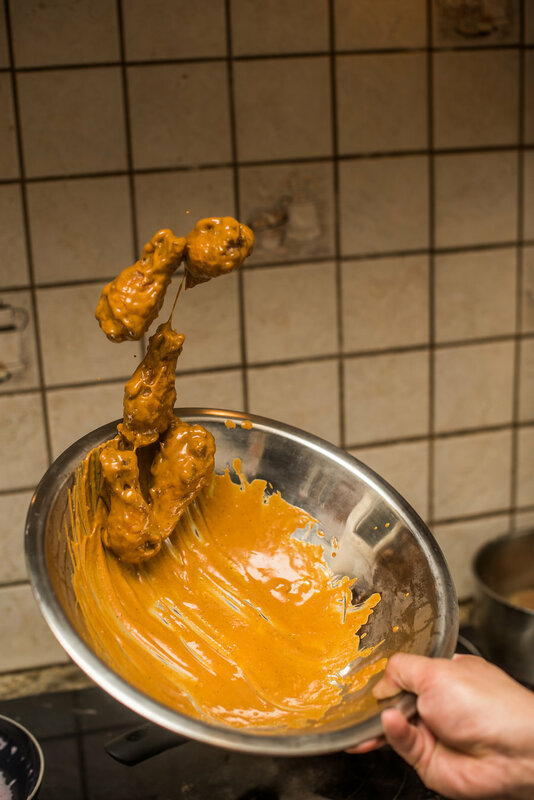 Eric Grivas and his brother Glen, the mad scientists behind the Filipino wing joint PI Wings, are quintessential California kids. They still go on occasional fast food binges, and make regular references to The Karate Kid — up to and including breaking out in a videoke-worthy rendition of Joe Esposito’s ‘You’re The Best’ during prep. Complementing their relaxed nature, however, is a serious respect for the traditional Filipino flavors that they’re presenting through their chicken wings — a five flavor menu of classics like Adobo, Arrozcaldo, Bicol Express, Kare-Kare, and Pinoy-Style BBQ. “Growing up, every day was Filipino food. My mom would prepare it, my uncle would prepare it — but the best food was always my Lola's. So that's how we learned about the basic principles: layering your oil, garlic, ginger, onion, bagoong, patis. So we’re very confident in our knowledge in the way it's made, knowing what to look for — and knowing what Filipinos are looking for,” Eric says. 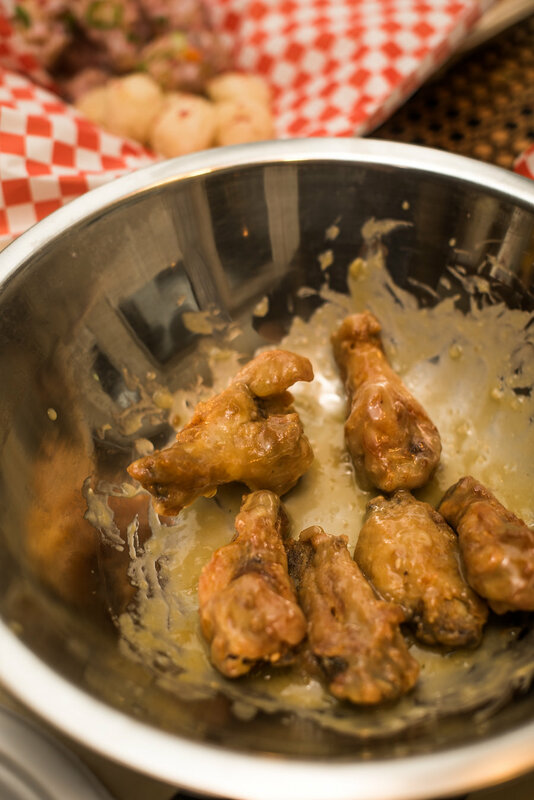 With 13 years of cooking experience across a range of cuisines — including Italian, Japanese, and, of course, American — Eric’s professional history certainly provides an element of pedigree to the food coming out of PI Wings. But both Glen and Eric say it’s really the comfort of working with family that really brings out the spirit of Filipino cooking and allows the food to communicate its message of familiarity. “We always pray the Rosary together before beginning to cook. It gives our cooking that spiritual flavor that’s crucial to Filipino food. We think it's that appeal of a fried wing that's so iconic, combined with flavors that for non-Filipinos are new, and for the Filipino-American audience, it's kind of novel and tempting because it blends two things that they can quickly understand. It's comfort food mixed with comfort food. Our motto is like Cobra Kai: ‘Cook first, cook hard, no mercy!’ But we’re just joking. We don't want our food to be intimidating, we want it to be welcoming,” Glen says. In that regard, PI wings sees Undiscovered SF as the perfect venue for engaging with a Filipino-American community that is just as likely to eat buffalo wings as they are to enjoy kare-kare over steamed rice while watching reruns of The Karate Kid. “Being at Undiscovered SF is an honor for us. The first time we went there was as attendees, and it was crazy. There were a lot of people, most of them Filipino, and they were mostly our generation: late '70s babies and '80s babies. And being a part of that, it's a different vibe. It's such a supportive environment and the word is spreading so fast. It seems like it's going to be a very big deal, and it's a way for word to spread about the vendors and the small businesses. And there’s really nothing like it. Something about it is different; it's not just Filipino. It feels Bay Area, it feels American, it feels California, it feels San Francisco -- but with a Filipino take. It feels like home,” Eric says. 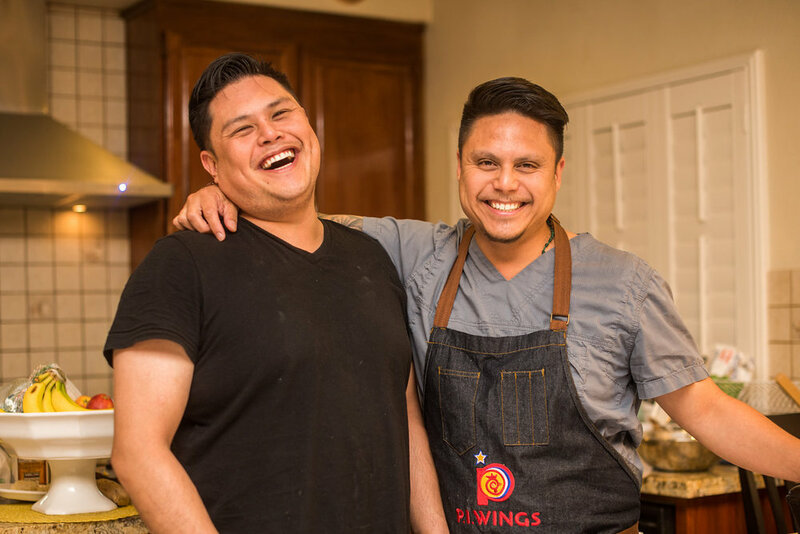 As Filipino-Americans, the question of ‘home’ remains persistent for both brothers, and they hope to continue exploring their Filipino roots via the PI Wings project and, indeed, Filipino cuisine itself. “Our next vacation we're going to make a short documentary, and visit the various regions and learn their specialties, talk to the community and learn about the history of the techniques and flavors -- and have it documented. And, with their permission, we're going to bring that experience back to California, and put it onto our wings. We don't know what we're going to find, so it's exciting,” Glen says.